In one version of the Island’s origin, when Jason and the Argonauts stopped here on their way back home, the island reminded them so much of their beloved Kerkyra (Corfu) that they named the island Kerkyra Melaine (black Kerkyra). The island eventually became Korcula. Our hotel in Vela Luka is named Hotel Korkyra. Korcula is the (supposed) birthplace of the great adventurer, Marco Polo. 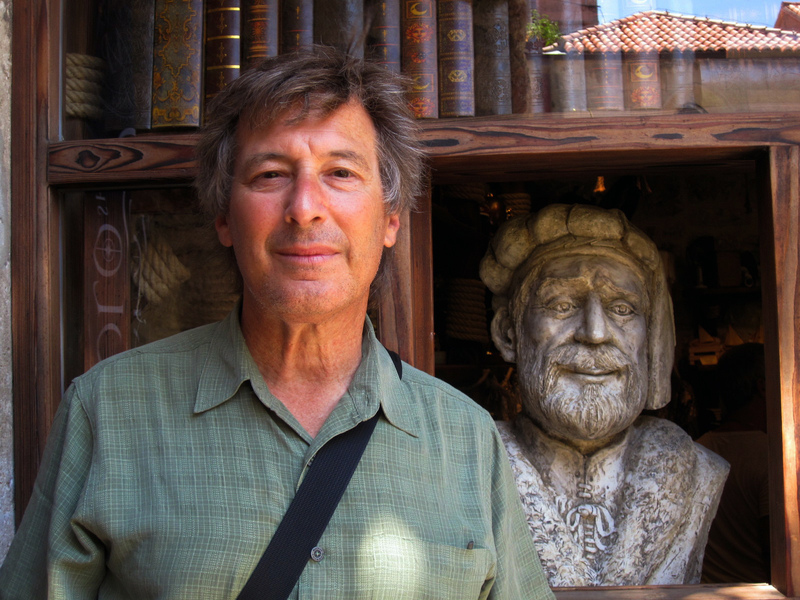 He is regarded as a Venetian, but Korcula was part of Venice in 1254, when he was born. 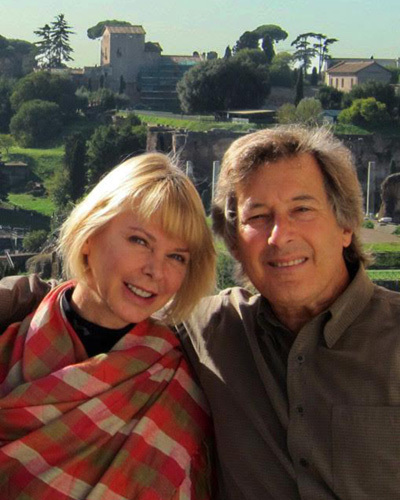 The registry of the Depolo family in birth records adds to the credibility, although the Depolo Street house that claims to be his birthplace wasn’t occupied by the Depolo family until the 1400s. Marco Polo died in 1324. The house is more or less an archeological dig. The bones of the house are still there but its more of an ancient ruin than a tourist attraction which is strange because every other building on Depolo Street is totally renovated and squeaky clean, including the Marco Polo Souvenir shops at each end of the two block long street. I guess the town council is still fighting over the plans to renovate this historical treasure. Polo is a interesting historical character. The mystery surrounding his birthplace is nothing compared to the mystery of his life. We know he was captured by a Genovese ship during the 1298 naval Battle of Korcula between Venice and Genoa that took place off the coast of Lumbarda, south of Korcula town. Polo spent a year in a Genovese prison where he met Rusticello da Pisa, the romantic novelist who took Polo’s adventures and romantically embellished them into the medieval adventure saga “Il Millione” also known as “Tales of Marco Polo”. The book does mention the discoveries of eyeglasses, ice cream, coal and paper money which could have come from Polo’s account from his time with Kublai Khan in China, but he never mentions things like chopsticks or the binding of women’s feet. His embellishments of riches and dinner parties for 6,000 people tend to be a bit overwhelming. Rusticello daPisa was a fiction novelist and couldn’t help himself. Between Polo and daPisa, they came up with some whopping tales. The book, by the way, was a best seller in the 14th century. Polo told so many fantastic stories that eventually, no one believed him. When he was near death, a priest come to him and asked if he would like to repent his lies and admit he made them all up. Marco Polo supposed last words were, “I did not tell half of what I saw.” The legend of Marco Polo is probably much better than the truth. Korcula town is a 14th century town filled with marble streets, fortress towers and Venetian gates. You’ll find lots of craft shops and wonderful (and relaxing) cafes and restaurants. You can actually see the entire town in a couple of hours. The “Land Gate” with its Venetian symbol of the winged Lion of St Mark is still the main entrance to the old town. It’s been the main entrance since 1391. Other towers of the fortification walls have literally been cut in half to accommodate the ocean walkway. It’s a bit weird but it all works. 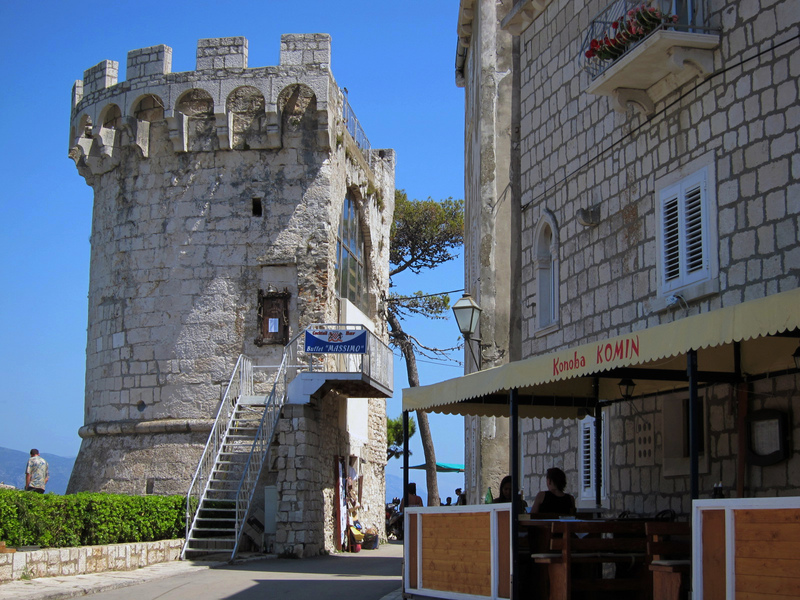 Sitting at the cafes outside the old fortification walls is one of the most relaxing meals you could ever have. The fortifications (mostly gone these days) did managed to hold off pirates, Arabs, Turks, and others for a while. In 1571, on route to the Battle of Lepanto in western Greece (a major whooping to the Ottoman navy), the Algerian Corsair Uluj Ali Pasha (originally an Italian from Calabria named Giovanni Galenti) took a slight diversion to attack both Hvar and Korcula Town. The Ottoman naval power was too powerful but just as the walls of Korcula started to fall, a mighty wind came out of no-where and wiped out most of the Corsair Fleet and saved Korcula Town. It was truly a divine intervention although we can’t find any reference to any Saint who saved the city. Usually with an event like this, some Saint of the church always gets the credit. We’re staying in Vela Luka on the other side of the island about 45km up and over the hills. Our Skoda Fabia chugs to get up them, our ears pop when we come down them and the views from the top are unbelievable. Vela Luka is the big harbor on the island. In fact, the name in Croatian dialect means “Big Harbor”. It’s a small relaxed harbor town with fishing boats, a town hall, a church, a post office, a few grocery stores and family style konoba restaurants surrounding the harbor. 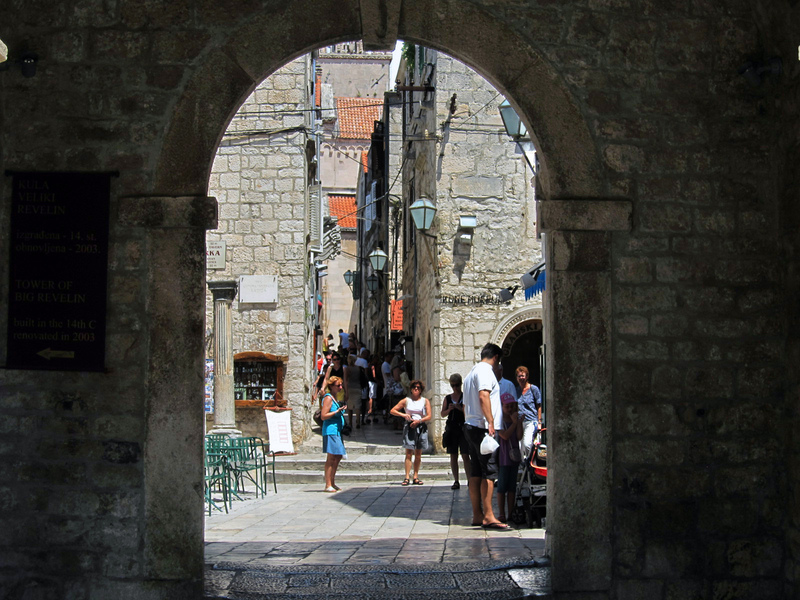 It’s very laid back, a much slower pace than the bustling tourism of Korcula town. We like it just fine. Vela Luka is also a direct ferry from Split. To get to Korcula Town from Split would have taken a lot longer. On Sunday, we watched an old passenger ferry cruise around the harbor carrying a marching band. They started around 11am playing oompah songs as the old boat marched around the harbor. By 7pm the concert cruise was over. It was right out of a 1950’s foreign film. We seem to be spending a lot of time at the Konoba and Bar/Café Casablanca. We go to the konoba for dinner and for coffee in the morning. We did try the Restaurant Pod Bore at the other end of the harbor one night. I read a review in some book that it was a good place for fish. The meal was so bad we looked to see if there were any reviews on the internet; Tripadvisor, Google, anything. The only review we found was from virtualtourist.com where the reviewer wrote “The food at Pod Bore wasn’t much to write home about, but it didn’t kill us”. That pretty much says it all. We went back to Casablanca where the fish is fresh and delicious, the wait staff is fun and entertaining and the Plavic Mali wines are dark and spicy. We used to the ink the Primitivo wines of Puglia were the ancestors to the American Zinfindel but now the feeling is the true ancestors are the Plavic Mali of the Peljesac Peninsula. Korcula is less than 3km from the the Peljesac Peninsula. We can see it from Korcula Town. The peninsula is right behind Gretchen in the photo. Its odd that the most contemporary hotel on the island is over here in Vela Luka where it’s mostly a working class population. I guess when they built they main road between Vela Luka and Korcula Town the owner of the hotel thought they’d attract a lot of the tourist trade. The Hotel Korkyra opened in 2010. We have a beautiful, well appointed room overlooking the harbor. The windows are very sound proof, the air conditioning is great, the internet connection is very fast and the bathroom is like a fishbowl. It’s a big glass room with no privacy. 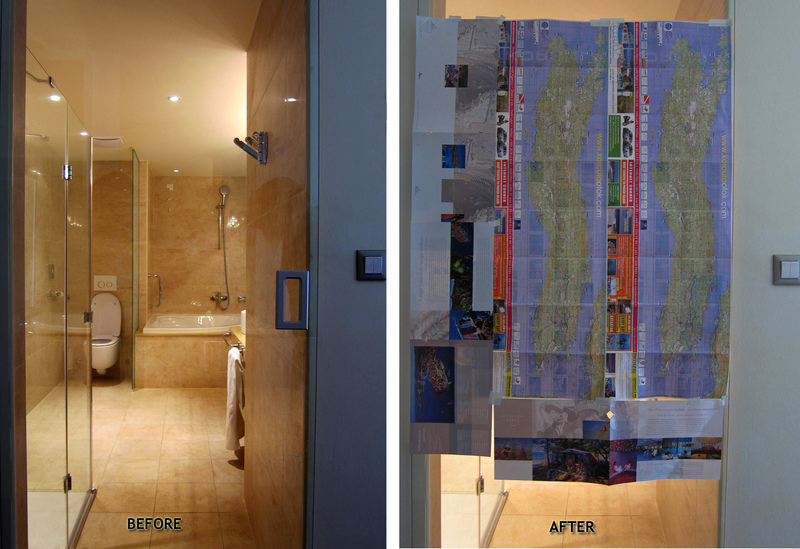 Gretchen brought a roll of gaffers tape with her (a great addition to the road pack) and we taped Korcula maps to the glass door. I applaud the lack of modesty of the Korcula Croatians. I used to love the photo of Frank Zappa on the toilet, but for us, there is something comforting about being removed from the rest of the world for such private moments. 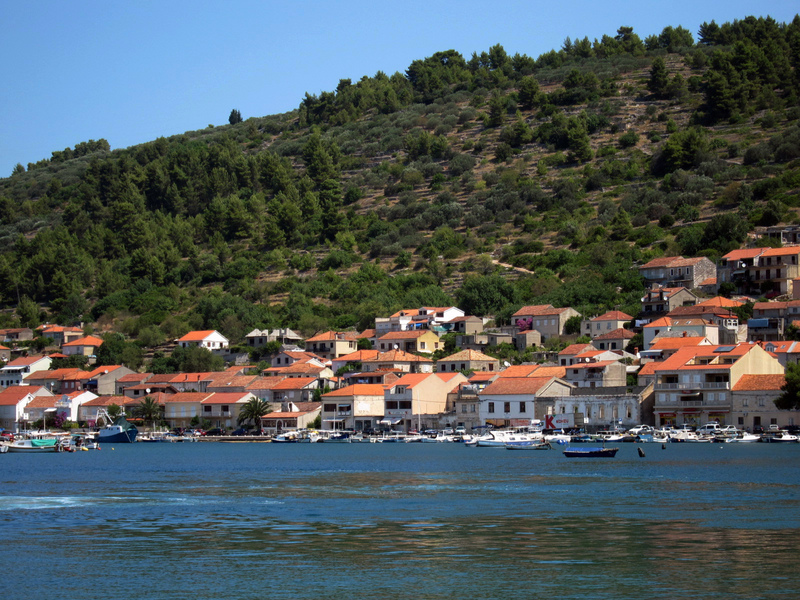 There are a few small towns between Vela Luka and Korcula. We did a few drive-byes but never got out of the car. West of Korcula, is Pupnat where they revived the tradition of severing the head of an ox during a festival dance in 1999. The revival only lasted a year. After the public outrage poured in, the Pupnats toned it down a bit. Close to Vela Luka is the wine growing district of Blato, which is a perfect name for a wine growing district. These days the town is also famous as the birthplace of Marija Petkovic, a local nun who helped sick and neglected children around the world. She was beatified in 2002 and there is an annual pilgrimage to her home. She smiles at you from a large road sign welcoming you to Blato. She is wearing dark sunglasses. Its pretty surreal. We did not visit Vela Spilja, the cave about 13km from Vela Luka where prehistoric earthenware was found and supposedly where Neanderthal man lived a few years back. We did not see a local tourist version of the 17th century sword dance called the Moreska, commemorating the defeat of the Ottoman Turks at the Battle of Lepanto in 1571. This dance is one of the tourist attraction that haunt most hotels and large restaurants in Korcula Town. However, we did eat a pizza called the Moresco with bacon and gorgonzola cheese. We did not get out to any of the nearby islands for a day trip. The island of Proizd, a short water taxi ride away, was voted the most beautiful island in the Adriatic in 2007. The beaches are supposed to be splendid and, as our front desk agent told us, most of the beaches don’t have shadows. 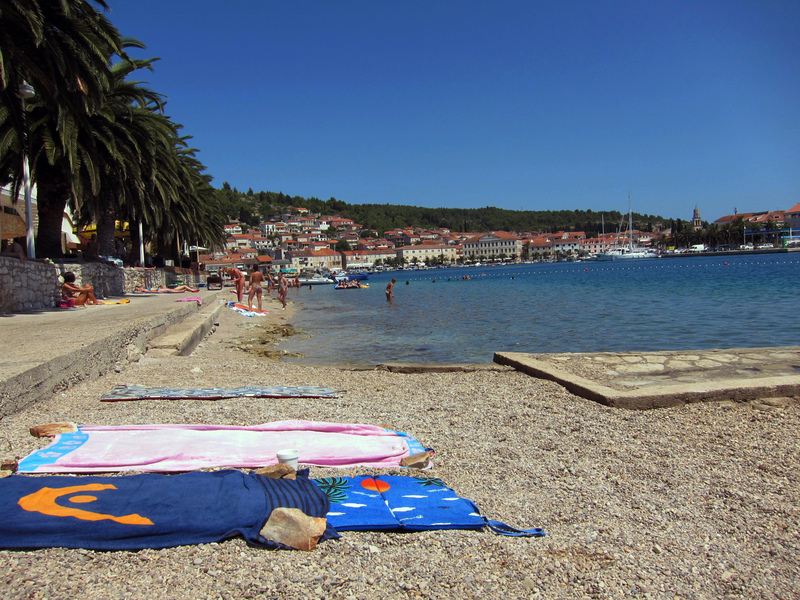 We tried but we missed the last taxi boat over so we hung out at the local beach in Vela Luka. It was splendid enough. And we never made it to the island of Lastovo where they celebrate the Poklad festival on Mardi Gras Tuesday. The festival commemorates the public ridicule and torture of a messenger sent by Catalan pirates. The townspeople paraded him through the street, then burned him at the stake. The modern version uses a straw Poklad. On our last night in Vela Luka we were sitting up on the balcony of the Bata Grill when 20 or so costumed locals started marching up and down the through the center of town. They ended up at the church for a grand ethnic folk festival of songs and dance. It wasn’t the Moreska sword dance but it was a lot of fun in this small working class community. Vela Luke is where you want to go to see the real Korcula. 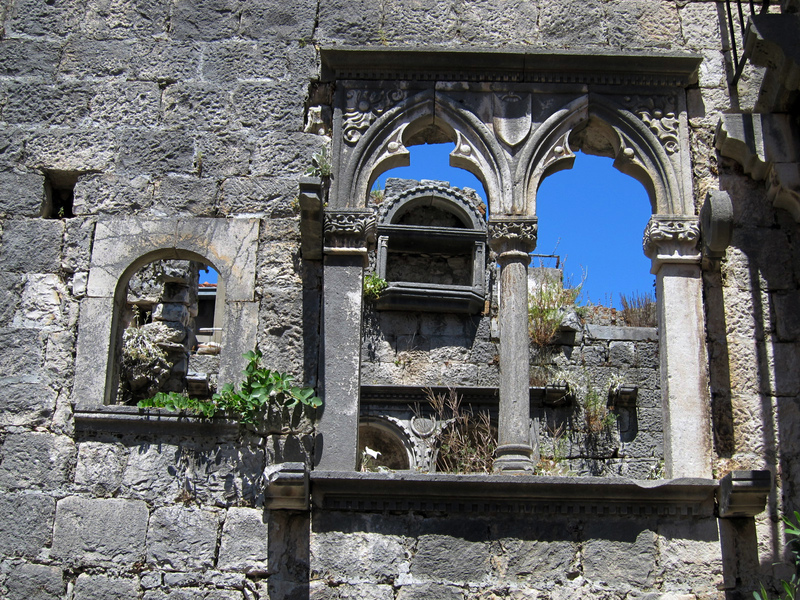 Korcula Town is where you want to go to see the precious tourist filled Korcula.